And as to my Rose of Sharon quilt, I finished up the fan quilting on a large section and can now work on that border area. We have had a few days of what I call ‘nice’ weather…not going above 75 degrees and cool mornings. I was out on my son’s deck on Friday evening with some friends who had come over with their dog…..She’s a Rottie just like Merle, my son’s. It was fun to enjoy the evening, have a beer, see the dogs play and watch the grand kids chasing lightning bugs, just as I did as a child and my boys did as well. 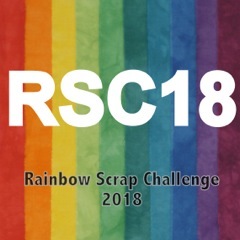 The RSC ( Rainbow Scrap Challenge ) color of the month is teal. So I just worked with what I had for another basket and two EPP ( English Paper Pieced ) Starflowers that I later appliqued onto a background. As to hand-quilting, I have made some progress off and on this week on my Rose of Sharon quilt. I’ll be sharing at So Scrappy for the Saturday RSC link up and at Kathy’s Quilts for Slow Sunday Stitching.